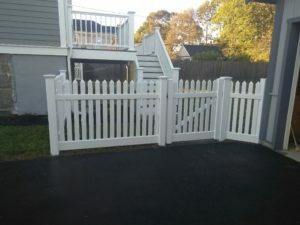 Vinyl fence installation comes in many various colors and styles. 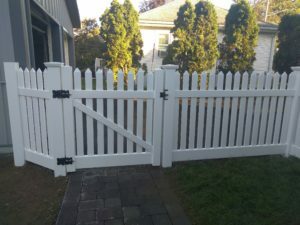 It is a great fencing option that does not deteriorate as quickly as wood fencing. Vinyl is a material that expands in hot temperatures and usefully contracts during cold. Because of this characteristic, it’s best to not plan Vinyl Fence Installation on extremely hot or cold days. Clearing and smoothing the area where the fence will be installed helps make the process easier. Try and remove any bushes, trees, or plants that are lying where the fence will. It’s also important to call the local utility digging hotline. This will provide information for you to know what to steer clear of with your Vinyl Fence Installation. The next step for your North Shore Fence Installation project is to measure the area. Some projects will go right along the property line, and others will have various configurations. Taking these measurements to the home improvement store helps with a number of materials purchased. Vinyl fencing is available for purchase in lengths that vary from 2 to 8 feet. If your area to be fenced is large, larger sections will result in fewer posts needed. If it’s important for you to have an entry point, most manufacturers provide a vinyl gate kit. After you have purchased materials that you need, it’s time to mark where you will post. These are important measurements because vinyl fencing cannot be trimmed to size. While you are laying out the fencing sections, it’s important to make sure the posts are in the right location. Set everything up and take a long look to assure the project will continue smoothly. During the digging of holes for the posts, the optimum depth is around 10 inches. It is best to end up with holes that are about 1/3 the length of each post. An additional 6 inches will be an appropriate base for gravel. While posts are being placed, the bottom of each hole is filled with 6 inches of gravel. A rubber mallet is a good tool to use for pounding the posts down. Quick-setting concrete should also be used to seat the post squarely and securely. Using a level is the best way to make sure your post has been installed correctly. After numerous posts are installed, it helps to return to the beginning and survey. During this time, make sure that all posts are seated level. Sloping the concrete is the procedure that uses a trough to carefully scrape away excess. This will help the concrete slope away from the pole and properly downward. Sloping correctly also prevents water from forming in pools during storms or irrigation. Now the concrete can properly dry. The final step is to install the vinyl fence sections between each post. In most kits, they will snap right into place. If necessary, you then attach the rails to the ends of each section using screws. The post tops are the last thing to attach. Most kits come with posts that snap on easily as well. 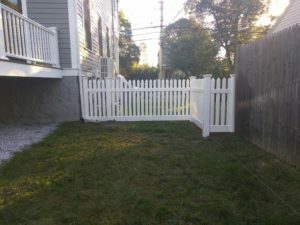 For a custom fence installation Saugus location project, a local professional may be your best choice. Opting to go with an expert company can save you time, and yield great results.